To ensure the spotless and pleasant interior of your car, rely on our staff. 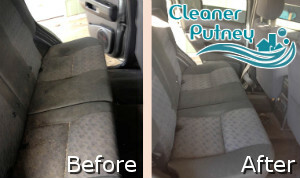 They can provide the car upholstery cleaning which you need. Our staff will remove the stains, unwanted smells, dirt and soiling which your vehicles have gathered. The cleaning that we offer is professional, effective and ensures impeccable and hygienic seats, headrests, car mats, doors, ceiling, luggage area and all surfaces. 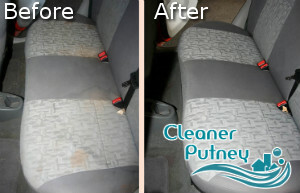 Take advantage of the car upholstery cleaning which we provide to the residents living in Putney SW15 and you won’t be disappointed. Our employees work fast, effectively and utilize high-end equipment of machines and suitable preparations. If your car upholstery have become darker, stained and filthy, contact us right away and we will send our cleaners to your place. They will inspect it and provide the necessary sanitising of the seats, headrests, floor coverings and all areas. Use our effective car upholstery cleaning services that are at your disposal in Putney during all weekdays, weekends and bank holidays. Our staff will pre-treat the stubborn blemishes with appropriate detergents to remove them easier. They will hoover and steam clean the upholstered areas in your car. The seats will be laundered, the car mats – washed and cleaned accordingly. After our staff clean and dry the upholstery, they will freshen it up with nicely scented deodorisers. Ensure the pristine condition of your car’s interior by using our professional cleaning services. The staff who work for us are preliminary trained, qualified and supplied with powerful machines and excellent quality preparations. Order the car upholstery cleaning which we provide in SW15 Putney and we promise you that your vehicle’s interior will become sanitised from top to bottom.